I don't usually talk about the famous (or to some, infamous) blog Pharyngula, since I try to talk more about the science of paleontology and evolution here, rather than the current political and social battles the scientific theory (which is not the same as one getting drunk one night and coming up with something) is facing in the United States. Not to mention PZ Myers doesn't talk much about speculative biology. But recently, he posted something so good I just had to link to it...vampire math. s =is the rate at which the Scoobies stake vampires (assumed to be the only important source of vampire deaths). When we try and plot this data, three different stable equilibria. The first is where the humans become extinct and the vampires, depending on humans for food, die out with them. The second is where the rate of staking is faster than the rate a vampire can sire victims, and so the vampires are extinct and the population of humans is near carrying capacity (the maximum amount of humans the environment can sustain). The third, however, is the interesting one. 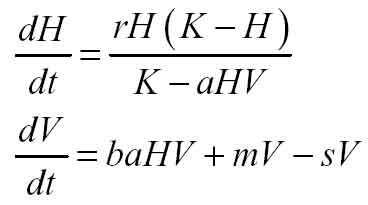 Setting the two equations equal to each other to find an equilibria, we find that in an average mid-sized California town like Sunndale that the equilibrium population will be about 36,346 humans, and for that many humans there will be an equilibrium of about 18 vampires. In a shocking case of irony, the actual population of Sunnydale within the show is barely a thousand or two a way from this, at about 38,500. The Hellmouth Factor. Basically, the hellmouth is a pandimensional back door, a place where the boundaries between worlds are weaker, allowing vampires, demons, and all manner of Eldrich horrors to enter our world. Since the Hellmouth itself is where vampires enter our world, there are two major reasons why the vampire population in Sunnydale would be higher. One, vampires who enter Sunnydale through the Hellmouth will attempt to settle in that area, since that is where they entered this world at and because there is an ample food supply around the immediate Hellmouth vicinity (casually referred to as the greater Hellmouth area). Two, transient vampires who have just entered the world through the Hellmouth will pop up in Sunnydale, and may try to feed before moving on to other areas where they can stake their territory. Hence you get vampires coming in all the time, and artificially "boosting" the population up. Other Food Sources. One problem with this study is it assumes that humans are the only food source of vampires. However, the large population of vampires in Sunnydale seems to be indicating that the vampires are feeding on other sources of food, which would allow a larger population of resident vampires than assumed from the mathematical models. Cows, pigs, sheep, deer, and dogs are all likely candidates for alternate components of a vampire's diet. In fact, I wouldn't be surprised if they occasionally caught rats and other small animals to supplement their diet. And whoever said vampires had to be strict carnivores. Perhaps they are somehow related to bats, in which case fish or even fruit may make up a part of their diets. These alternate food sources would bring the overall population of vampires up, as an area richer in food allows more predators per square mile. Metabolism. Something that most people don't realize about blood is that it is very poor in nutrition. Its over half water, and the rest is very low-energy material. The vampire bat, in fact, has to feed every other night or else it will starve on its low-calory diet. because of this, vampires may be low-metabolism creatures, mostly placid and slow, but capable of quick bursts of energy to attak and subdue prey, much like a modern snake. If this is true, vampires may be able to fast and go without blood for long periods of time, thereby increasing the amount of vampires an area can support. If one decreases the amount of times a vampire needs to feed, the population of prey becomes larger and can thus support more predators. Vampire Mating. One thing this study never really talks about is exactly whether or not vampires are limited to reproduction-via-bite, or whether or not they can reproduce via normal methods (as for what that is....ask your mom). If vampires can reproduce in the usual way as well as through bite reproduction, then the vampire population can grow much, much quicker than through just bite reproduction. Vampire Parenthood. Another thing that is not talked about is whether or not vampires have any sort of parenthood. I'm not just talking about vampires raising natural born children, but do they act like "parents" to their turned victims, showing them the ropes of vampirism, or are they like fish and just leave their offspring behind, to fend for themelves. These two styles of reproduction are known as r/K selection theories. Animals that are r strategists try to create as many offspring as they can in as much time as they can, but they invest no care in the offspring and thus few of them survive. K selected animals invest time and care in their offspring, and normally these animals tend to live a lot longer than r selected ones. But there is a downside, K selected animals only produce a few offspring at a time. This is another important factor to consider, as it affects the survival rate of vampires in the population. Other Predators. The Buffyverse isn't just filled with vampires. It is home to demons, werewolves, Eldrich horrors, and the occasional god thrown in for good measure. Most of these have a taste for human flesh, or some other food source derived from humanity. Because these various creatures are competing with the vampires for their food, the vampire population is expected to be lower due to the increased competition. Other supernatural creatures may also add into the death rate, I mean lions go out of their way to kill hyenas on the African savannah. For those who wish to read the study in its entirety, it can be found here (http://www.hphomeview.com/Tips/Vampire%20Ecology%20in%20the%20Jossverse.pdf). Perhaps someday I will post my own ideas on vampire evolution and ecology, but for now enjoy this facinating thought experiment via a fusion of math and ecology! Oh, crap, Christmas came early. I meant for this to get published tomorrow morning, but stupid blogger posted my article now. Ah, well, enjoy. Vampire Math - never thought of it that way. Great post! Very informative!